Emmerson Mnangagwa has been sworn in as the President of Zimbabwe, following Robert Mugabe’s on-off resignation. In his rambling inauguration speech Mnangagwa was keen to heap praise on his “father” and “mentor” which added to the heap of slogans he used in Mugabe’s praise — an attempt to rehabilitate his former boss. The Central Committee of the Zimbabwe’s ruling party, ZANU-PF, has succeeded in removing Robert Mugabe as its leader. There were celebrations in the streets of the capital, Harare, on Tuesday 21 November, after Mugabe resigned, giving way to former Vice President Emmerson Mnagagwa to take up the post of President. The end of Mugabe’s 37-year rule follows a fortnight of events which started with Mugabe’s removal of Mnangagwa as Vice President and continued in the Zimbabwean Defence Forces taking over TV stations and government installations around the country. Intimidation, arbitrary arrests, and beatings are hideously commonplace for LGBT people in Zimbabwe. Behind these conditions stands President Robert Mugabe, now in his 34th year as leader of the ruling Zimbabwe African National Union – Patriotic Front (ZANU–PF). Robert Mugabe has claimed a landslide victory in elections held in Zimbabwe on 31 July for the presidency and national assembly. Yet Human Rights Watch reports that many voters were turned away and many duplicates were on the voter roll. A mole inside Mugabe’s Zanu-PF correctly predicted the alleged assassination of one MP and claimed that “disappearing ink” pens had been supplied to polling stations. Read more about Zimbabwe poll rigged? 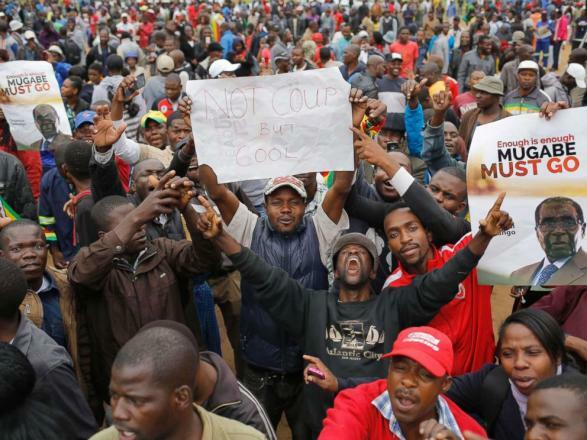 Six Zimbabwean socialists have just been convicted of “inciting public violence” for organising a meeting about the Egyptian revolution, but to general surprise were given fines and community service instead of prison sentences. Mike Sambo, National Treasurer of the International Socialist Organisation of Zimbabwe, and the defendant in another trial related to that of the six, spoke to Solidarity. From the outset it seemed that the state wanted to send the comrades to jail. Six Zimbabwean activists arrested in February 2011 at a meeting about the Egyptian revolution face up to ten years in prison after being convicted of “inciting public violence”. They were due to be sentenced today, Tuesday 20 March: they face up to ten years in prison, or a fine of $US2000, or both. Read more about Don't let Mugabe jail Zimbabwean socialists! Members and friends of Workers' Liberty protested outside the Zimbabwean embassy in London on 2 March against the treason trial currently being conducted in Zimbabwe. Seven socialist activists, members of the International Socialist Organisation of Zimbabwe, could face years in prison if convicted. Our comrade Janine Booth, who represents London Transport workers on the RMT trade union national executive, handed in a letter of protest to the embassy. 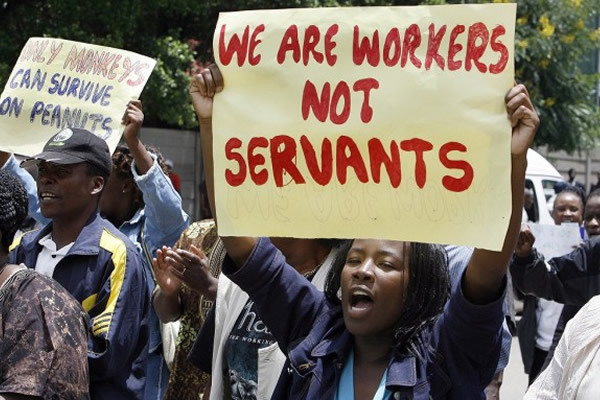 The Zimbabwean state is prosecuting a group of socialist, trade union, student and human rights activists (many of them members of the International Socialist Organisation of Zimbabwe) for treason. Solidarity protest: Stop the treason trial! Free the Zimbabwean socialists! A group of socialists, trade unionists, student activists and human rights activists are on trial in Zimbabwe for treason. Many of them are members of the International Socialist Organisation of Zimbabwe. If convicted they face years in prison. At one point the government was prosecuting 39 individuals, but this has now been reduced to seven (though the charges against the others have not actually been dropped). The comrades will fin out on 15 February whether the government will proceed with the trial. They need solidarity! Read more about Zimbabwe: stop the treason trial!